The trial of 23 protesters, including human rights activist Sanaa Seif and human rights lawyer Yara Sallam, on charges of illegal protesting this summer has been adjourned to 26 October. The misdemeanour court also ordered the defendants to remain in detention until then, when the court said it will deliver its final verdict. Among the defendants, in addition to Seif and Sallam, are photojournalist Abdel-Rahman Mohamed, who works for Al-Badil news website, and photographer Rania El-Sheikh. The defendants were arrested in June during a protest held near the presidential palace in Heliopolis to denounce the country's protest law. The demonstration ended in clashes with security forces. The protest law, passed by decree in late 2013 and stipulating jail terms and fines for those who protest without police permits, has been criticised by local and international rights groups for being heavy-handed. Seif, a renowned human rights activist, has been on a hunger strike for more than 44 days to demand her release and the cancellation of the protest law. 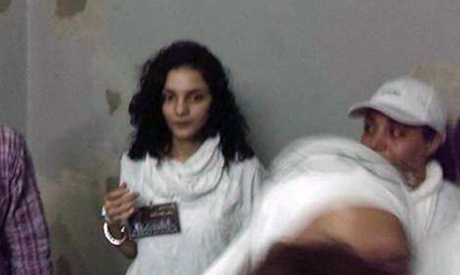 Her father, Ahmed Seif El-Islam, a prominent human rights lawyer, died in late August while she was in detention. Her brother, Alaa Abdel-Fattah, is a renowned blogger and activist who was at the forefront of the 2011 uprising and who was released last month on bail pending trial, also on charges of illegal protesting. Over 100 detainees in Egyptian prisons are on hunger strike as part of a campaign to revoke the protest law and for all political prisoners detained under its provisions to be released. A number of political activists and family members remain on hunger strike in solidarity with the detainees. Meanwhile, Cairo criminal court has adjourned the trial of hunger striker Mohamed Soltan and extended his detention. He has been on hunger strike for over 250 days, with reports emerging recently that his health is failing.